I'm just going to share my SPRING Mantel with you. Emphasis on the word SPRING. I think that alone should tell you what I'm not going to say today. This mantel is a simple one. 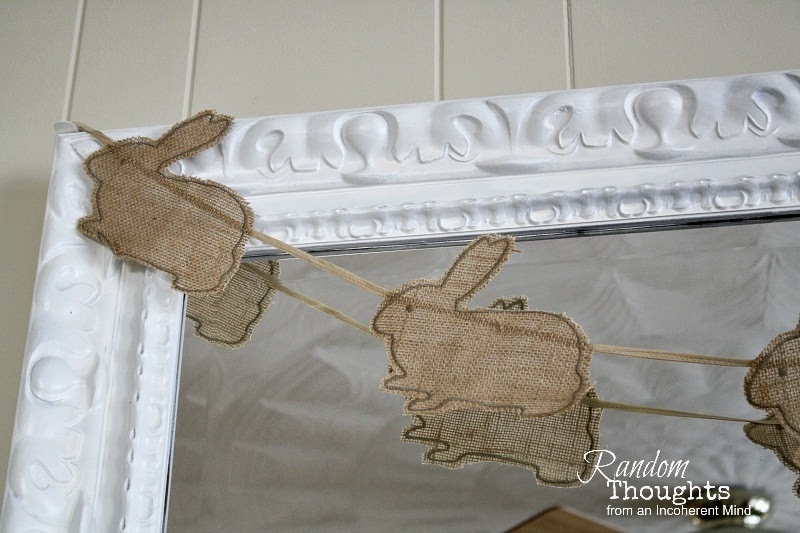 It all started with the burlap bunny banner on the mirror. and I came across this banner. I ogled it a bit, then walked away. I later came back to it. "You can make that yourself." having to do anything but hang the darn thing. 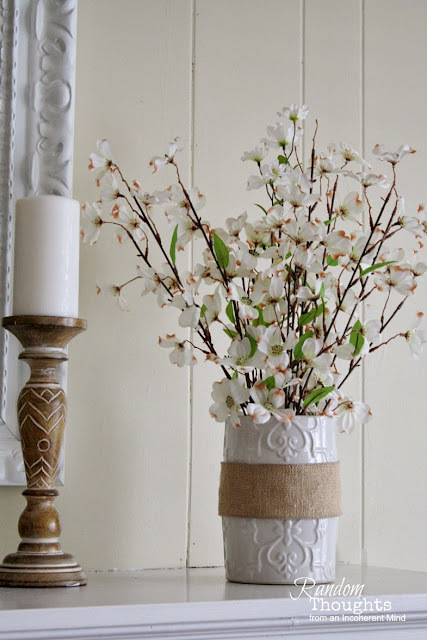 I then added some vases full of dogwood blooms to each end. that they would coordinate with my burlap bunny banner. I also added my wooden candle holders. in the garage, just waiting for inspiration to strike me. This window was an old one from our dining room. along with a grapevine wreath that I threw together with moss and robin's eggs. and added them as well. Very nice. Sometimes it's cheaper to buy than get all the supplies to make something. I like the colored ribbons on the plain banner. Oh Gina...it turned out adorable. I need to go to Target. It has been awhile and I am missing out on some cute things! Gina, I think this is my favorite mantel so far! It's simple but really emphasizes spring! Love the bunny banner... yeah, you could've made that but I hear ya! Sometimes I'd rather spend 5 bucks than make something! OH the mess I make when I "make" something! Love it Gina, especially the bunnie banner...so cute! So pretty and cheery, Gina! Now if it would start to look and feel like spring on the outside, I think we'd all be happy!! Very cute! I love the banner with the ribbons and the dogwood blossoms. 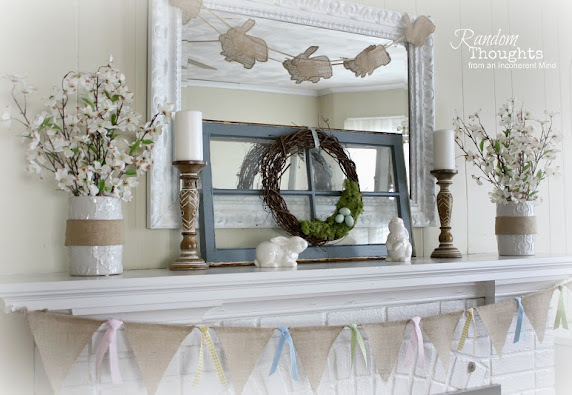 Such a sweet spring mantel! I hope spring arrives soon at your home! Love your spring mantle and especially love the bunny banner. You are so lucky to have old windows in your garage that you can use for décor in your home. And yes, it IS supposed to snow tonight, least that's what I heard. So there. I said it for you. LOL. Not to forget it is spring and you are doing a wonderful job making it look so springy. Well done. Hugs. (Sorry I have been so MIA. Life has done a little crazy stuff to me and I haven't been able to get to blogland much. I do hope to catch up on all m y missed reading. Missed you!) HUGS. Your mantel is adorable Gina. I did not spy that banner at Target for 5.99 I would have for sure bought it too! 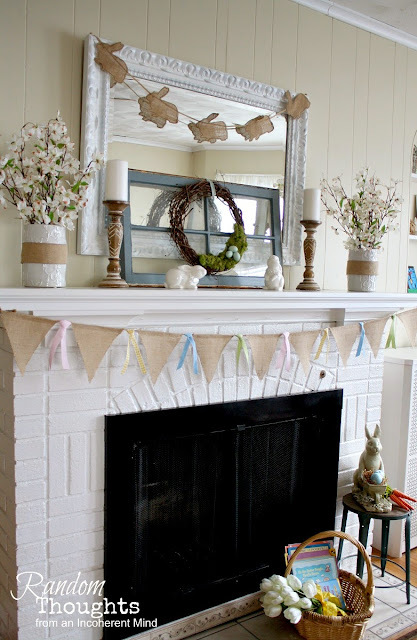 Gina, I adore your Spring mantel! Bunnies are one of my favorite things! Your banners are perfect! I'm with you on buying the one at Target. The supplies and your time would be more than the cost of the bunny banner! 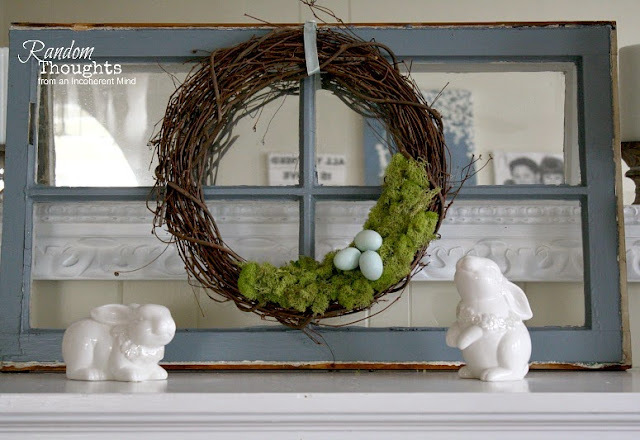 Your mantel vignette is so pretty! No spring today here, snow and cold! OK...So I am guessing that your weather is not spring like lol! Sometimes Gina, you just have to buy it...It is not worth it to make and it is adorable and so is your perfect mantle! 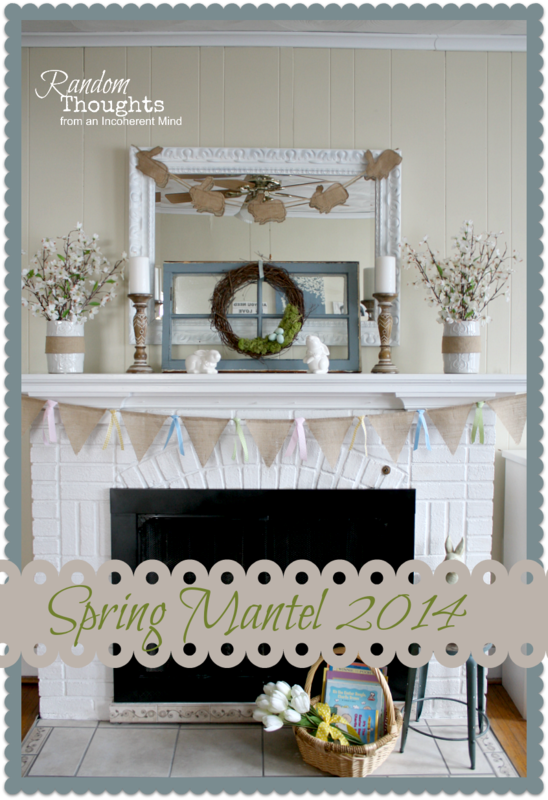 Just the right amount of spring on your lovely mantel! Love it!! Have a wonderful week! Love it, Gina! I would not have passed up that cute little bunny banner, either. I really like the layering of the old window against the mirror. If this entire scene does not call forth Spring, then I don't know what will. I do hope it is coming your way very soon! Gina, your mantel always looks so perfectly put together. I have to confess that I rarely do anything new to mine - I need to be better about that! Beautiful job and I do hope Spring is coming soon. Here in Georgia, it is dipping back down to 29 degrees tonight - what????? Gina, your mantel is so fresh and pretty! I love it and I love your great little banner across the picture. It goes so perfectly with the ones on the mantel. You are always so full of great ideas. Gina, your mantel is so pretty. I haven't finished mine, possibly because I made some bunnies to use on it. If I'd just known that there was a bunny banner waiting on me at Target, I would have been there in a skinny minute! It all looks so Springy and beautiful! Love, love, love the bunny banner, soooo cute. Another seasonal mantel well done my friend. Your mantel is so pretty! Love all the details. LOVE...LOVE...LOVE, the BUNNY BUNTING!...and the BOTTOM BUNTING too! I am going with muted tones for Easter this year as well. The weather goes without saying for sure! March has brought record rains which must have turned to record snowfall when the hit the Rockies. I see that my mid-west and upper east coast friends are still shoveling. I so hope that the arrival of April closes the book of Winter! Our hillsides and cliffs are so compromised right now! The best of love to you and your sweet family! It's just the sweetest looking mantel Gina. The bunny banner is so cute. Gina, I agree; why make it when you can buy it for that price. I love burlap and this all came together so cute! Love the pop of color with the added ribbons. Thanks for sharing with SYC. Oh, Gina! You do make the most beautiful mantel arrangements! So pretty!